SF: How did you first meet Colin? GG: Colin had become acquainted with us and our skills whilst visiting car shows in Turin and Geneva in 1971-72. Our PR Director was involved in the racing world; we got in touch and he commissioned us to do a study of a new super-car. SF: What was the appeal? GG: It was the appeal of a make that was a Formula One winner. The Lotus brand was synonymous with dynamism and speed, for lightweight, high-performance cars. It was this that gave me the inspiration for the Esprit's penetrating, 'Sharp' shape. SF: How do you set out designing a new car? GG: Occasionally the brief we receive from the customer is extremely detailed, and I am given a great deal of general information about the car I have to build, about the chassis, the mechanicals, and market research to define the type of customer it targets, etc. Other times the input is more open-ended and I am free to propose newer less 'traditional' ideas. Today companies want us to build a model based on a 'platform' that can be adapted to the needs of a number of versions (deluxe, sports car, coupe, SUV, etc.). The project has to be analysed in the tiniest detail, even taking into consideration the dictats of insurance companies, the demands of maintenance workshops, and the recycling of materials after the car's lifetime for ecological and environmental reasons. Today styling and engineering companies are expected to include so many specialists and skills, that in just 10 years our workforce has almost doubled in size. SF: Were you given a free rein in the Esprit design? GG: Even though we were free to make proposals from an 'architectonic' point of view, costs and the use of the fibre-glass technology, with which Colin was an expert (we tended to work with sheet metal) certainly restricted us a little in terms of the shape. 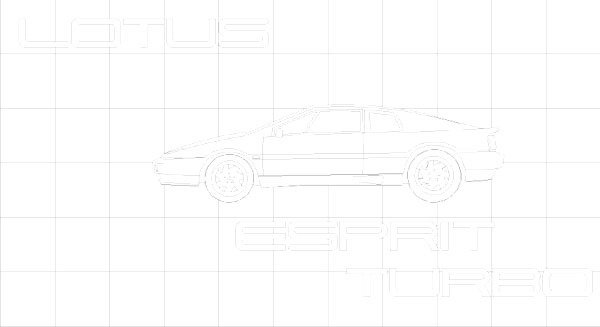 The birth of the Esprit, in which we co-operated with Mike Kimberly, Lotus Technical Director at that time, we not without its painful moments. Colin asked me for a 1:4 scale model to be built as soon as possible for aerodynamic tests. We did this quickly but the design itself obviously needed some fine-tuning. He was disappointed by the results in the wind tunnel (the CX coefficient which had been given by the test was 0.34) so he decided to put the project on hold. In Colin's opinion, an attractive aesthetic also had to be functional. If the shape and the architectonic aspect of an object matched its aerodynamics and functionality performance, then it could be considered a beautiful object! Our scale model did not meet the aerodynamic requirements he was expecting and so he cancelled the project. 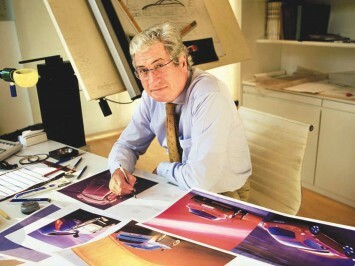 GG: I still wanted to build the full-sized model and finish it in time for our stand at the Turin Motor Show (in 1972). We built a plaster and resin model of the exterior with real doors, and a perfectly finished interior reflecting the general dimensions and mechanical elements we had agreed with Colin. Chapman was fascinated by the prototype and decided to develop it using fibre glass technology. It was put into production in October 1975. Five years later, in 1980, Chapman presented a Turbo version of the Esprit, which still maintained the bodywork and interior that I had designed. The Esprit clearly had a 'graphical', rigorous, linear style, as if I had imagined it in two dimensions rather than as a 3-D sculpture. The Esprit was a new departure from previous designs I had been involved with: together with the Maserati Boomerang it introduced architecture to our roads and although it had a few imitators, it represents the shape that manufacturers of spirited sports cars still try to emulate. SF: Did the Esprit change much from your initial concepts through to the first production model? GG: The production model was improved from an aerodynamic point of view. The lines of the lids and doors on the car were modified and a moulding in the centre of the waistband fasica was introduced to hide the junction of the two 'walnut shells' body sections. All of the inside controls and switches were housed in a single semicircular instrument panel block (easily displaced for left-hand drive versions) which made it easier to activate all the controls without taking your hands off the wheel. On the turbo version, there were new front and rear bumper elements, with spoilers and air inlets in the sides. And the rear end was particularly attractive because it incorporated the light-clusters in a single strip whereas before they were almost haphazardly arranged on the tail end. SF: How did you feel when the car was launched? GG: I was of course very proud and satisfied. For example, the windshield inclination (18 degrees) was extreme for that period but only after the mass production of the Esprit was I able to demonstrate that all the glass manufacturers' fears were maybe inspired only by laziness. SF: How long did you continue working on the Esprit? GG: The body and the interior of the turbo version (presented at the Geneva Motor Show in 1980) were still mine and that's all. It was not a very long project. SF: What do the think of the current Lotus models? Do they maintain the 'spirit of Lotus'? GG: Yes, I thing the Exige and the Elise maintain the spirit of the brand. SF: How do you think the sports car industry has changed? GG: The technological improvements in the automotive field and the big boost which has been given to mass production cars in their different typologies have somehow reduced the gab between series cars and sports cars as far a performance is concerned. Therefore, the state-of-the-art sports cars for sports men able to drive them are going into decline. SF: What are you doing now? GG: I'm working on a large number of projects, both in the automotive and industrial design fields. Right now I would like to do some designing in the field of aeronautics, a fighter aircraft would be my dream. SF: Would you like to be involved with another Lotus design if they asked you? GG: Of course I would; I have a very good memory of our past relationship. SF: How would you like to be remembered? GG: As a man who has spent 40 years in the automotive field and has made some small contribution to improving and developing the car.